A HOBBY IS BORN – AND NOW IT IS A WEBSITE! Growing up in Southern California, I was truly blessed to be a sports lover. Within the state of California there are so many professional sport teams, in fact California has the most professional teams of any state. Between all the professional sport teams, California has 15 teams to be a total fanatic of a particular team and sport. 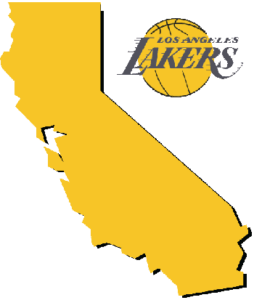 I always wondered when I was a kid, how did the Los Angeles Lakers (my favorite team) came to be in Los Angeles? How did they get the nickname “Lakers?” What arena did the Lakers play before the “Fabulous Forum?” Well the road to LA has some interesting twists and turns as does most professional sport teams throughout the country. So I investigated the history behind all the professional sports team history. AND SO…SPORTS LOGO HISTORY AND SPORTS TEAM HISTORY WERE CREATED! So my question to you is: What team did you grew up with and have you asked the same questions? Sports Logo History and Sports Team History, can answer any of these questions and more. Here at Sports Logo History you be able to see the progression of each team’s logos from their formation day to the present day. At Sports Team History you will be able to see all the information about any team in the NFL, NBA, MLB or NHL, including creations of nicknames and previous cities. As to answer to the questions that I has been with me since my childhood, I researched the history of the Los Angeles Lakers. The Laker name originated in Minnesota the land of 1000 lakes. Which makes sense for the nickname of Lakers in Minnesota. But in Los Angeles, the Laker nickname seems out of place. Of course now the name “Lakers” is symbolic with Los Angeles and will never change. The Minneapolis Lakers are the original “Lakers,” from 1947 to 1960 and the Minneapolis Lakers won 5 NBA Championship before moving to Los Angeles in 1960 to become the Los Angeles Lakers. The Los Angeles Lakers went on to win 11 more NBA Championship. From their conception some teams have made several city or name changes and some teams have never made a change in their entire existences. Has your favorite team moved or changed their name? Check out Sports Logo History and Sports Team History to find out about my passion for Sports History! I hope you enjoy my hobby, but please don’t take it too seriously as most fans/fanatics do!!! Sports Team History investigated the history behind all the professional sports team history. What team is your favorite and see their history?